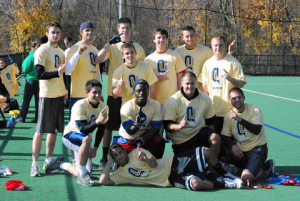 After four years of waiting, Show Me Your TD’s are finally able to call themselves Quinnipiac intramural Division I flag football champions after defeating the Cleveland Teamers 37-0 on Sunday. Show Me Your TD’s have played in the flag football league since the start of their freshman year, and almost every year they always came close but never were able to win the championship game until now. From the start of the game, the seniors came out aggressive scoring four touchdowns in the first half and scored once on a two-point conversion giving them a comfortable 26-0 cushion going into the second half of the game. Their explosive offense did not stop here as another touchdown was immediately recorded to start off the half making the score 32-0. Due to the intramural flag football mercy rule, which states that if a team is up 35 points the game will end, the anxious seniors quickly got the ball back on offense and made their way down the field. Dan Mascaro was the hero, securing the victory after scoring the final touchdown of the game. Mascaro described this season as being not as competitive as the three prior ones, but was still fun to be apart of. “It was great to mercy them and as a team I think our defense was really good, especially Steve Strait at safety and Frankie DiSomma,” Mascaro said. The defense has been key to their success this season, according to Mascaro. The defense helped lead the team to a perfect undefeated season. The senior boys immediately began jumping on Mascaro and celebrating their title as champions after polishing off their final flag football season at Quinnipiac. “Its good to graduate knowing we finally won flag football,” DiSomma said.